Going into “The Other Guys” I felt like Will Ferrell owed me something. I’m a huge fan of Ferrell, having held a “Ferrell = Opening Weekend” stance for many years. That policy was called into question last year, however, when “Land of the Lost” attempted to use its awfulness as a weapon with which to murder me along with the rest of the audience. Lifelong Ferrell fans everywhere began to turn on the man and while I remained loyal, I confess it was a wavering loyalty. Still, the sheer joy that this guy has brought into my life over the years could not be thrown away so easily. How could I hold “Land of the Lost” and “Semi Pro” against the man without also taking into account the absolute genius of “Anchorman” or the juvenile magnificence of “Step Brothers”? They can’t all be good, you know? All that said, though, I needed Ferrell to prove to me and the rest of the world that he is as talented as I make him out to be in my head. I needed “The Other Guys” to atone for the sins of “Land of the Lost” and while I’m not going to say this is up to par with the other (director) Adam McKay-Ferrell pairings, it goes a long way toward erasing the memory of that last atrocity. Allen Gamble (Will Ferrell) and Terry Hoitz (Mark Wahlberg) are two desk-jockey cops in a department headlined by Highsmith and Danson (Samuel L. Jackson and The Rock) who have a flare for the dramatic. Gamble wants nothing more than to do paperwork and stay off the streets while Hoitz dreams of getting back to the big time after a hilarious incident involving Derek Jeter derailed his career. When they attempt to make a meager licensing violation arrest, the pair finds themselves wrapped up in a case that is miles above their pay grades and threatens to bring their lives crumbling down around them. Oh, and also, Michael Keaton is their boss. I just felt like it needed to be said so that you would be prepared for this should you decide to see this movie. It was a huge shock to me and it took me the length of the film to adjust to Michael Keaton actually being in a movie. One of the qualities I look for in a film, and one that is often missing, is flow. Put simply, I want the movie to establish the path it chooses to walk and move fluidly from the beginning to the end. Scene-to-scene transition, significance of every shot, and firmness of the film’s identity are usually the spots that either make or break the flow. If the scenes start and finish smoothly, if there aren’t many (or any) wasted scenes or lines, and if the director shows an understanding for what he wants the film to be, chances are the momentum will carry from beginning to end in continuous fashion. “The Other Guys” hits quite strongly on those first two points of emphasis but falls short on the third requirement, thereby keeping the film from reaching its full potential. It felt to me like McKay couldn’t decide whether he was making a faux action comedy or if he was making a full on humor filled action flick. Because of that the scenes are somewhat choppy, giving the audience the roller coaster effect. You never really settle in for the trip the movie wants to take you on. On the plus side, Ferrell gives perhaps his best comedic performance since the fabled “Anchorman.” Gamble is a stuffy, relatively gutless accountant-type who enjoys nothing more than following the rules. In essence, he is the opposite of the typical Ferrell character. Ron Burgundy and Ricky Bobby would hate Allen Gamble. I feel this role displayed a bit of Ferrell’s range. I think the average movie goer believes this guy to be a one trick pony but in truth there is a lot of depth to his pool of talent. Burgundy, Bobby, and Frank the Tank may all be screaming buffoons but they’re very distinct and versatile buffoons. Gamble, though, is a horse of a different color and Ferrell nails him perfectly. He is without question the driving force behind “The Other Guys” and I personally think that anyone else in the title role would have sunk this thing. Everyone else in the cast, though, is a bit off pitch. Wahlberg does his fair share but, my Marky Mark man-crush aside, he seems a bit overstretched at times. Eva Mendes is way out of her league as Gamble’s wife, Ray Stevenson is the poster child for the roller coaster feel of the characters, and Keaton is an absolute mess. Between this and his last endeavor, “Post Grad” (second worst movie of 2009), I’m starting to have a hard time remembering that he was once perhaps the biggest movie star in Hollywood. Honestly, this group seems like they didn’t how to make an Adam McKay movie. I believe McKay is a director who relies heavily on the improvisation abilities of the cast to keep the ball rolling and whereas Ferrell thrives under this mentality, actors of lesser funniness (read: everyone else in this movie) seem to struggle. 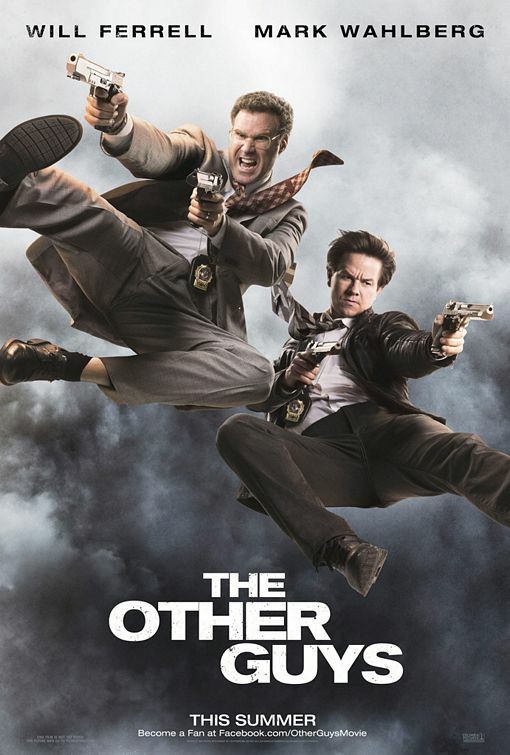 “The Other Guys” is a solid-enough action-comedy that simply falls short of the other McKay-Ferrell collaborations. In a way it sort-of sums up the entire movie 2010 movie calendar: good entertainment but far from epic, significant, or enduring. I’d watch it again but I wouldn’t watch it a dozen times, memorize the lines, and name my fantasy sports teams after various characters like I’ve been known to do with “Anchorman”, “Talladega Nights”, and “Step Brothers.” If nothing else, however, it provides an opportunity for Ferrell to shine and serves as a heartfelt apology for the “Land of the Lost” debacle.